Let’s talk Christmas colors. 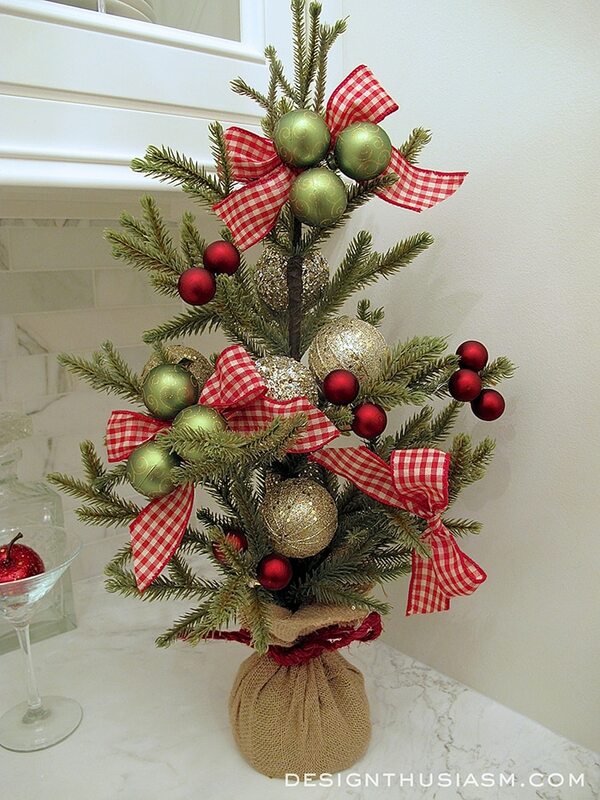 Are you a traditional red and green decorator? Do you pick your colors because you love them or because you think they’re what you’re supposed to use? 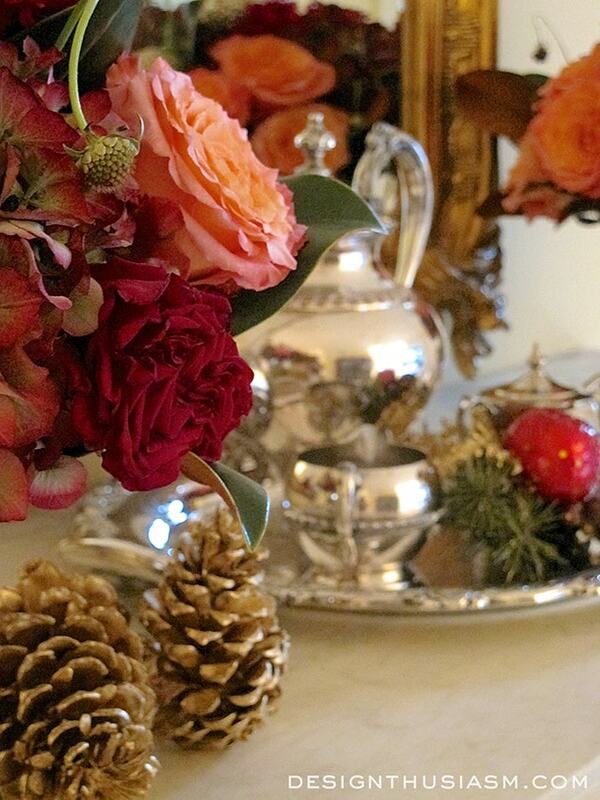 If you’ve followed my blog through my fall decorating, you already know I’m a bit of a rebel. And this year I’m crushing on soft warm tones. 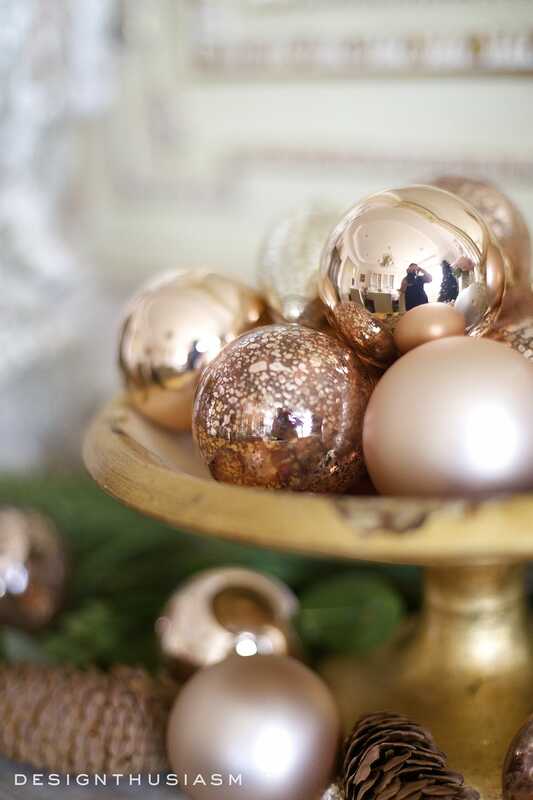 So, I want to talk about how (and why) to use rose gold Christmas decor for the holidays. It’s not that I don’t like red and green. Done right, it can be lovely. Maybe a rich crimson and a deep hunter, offset by a linen white. Yep, I just might do that palette next. 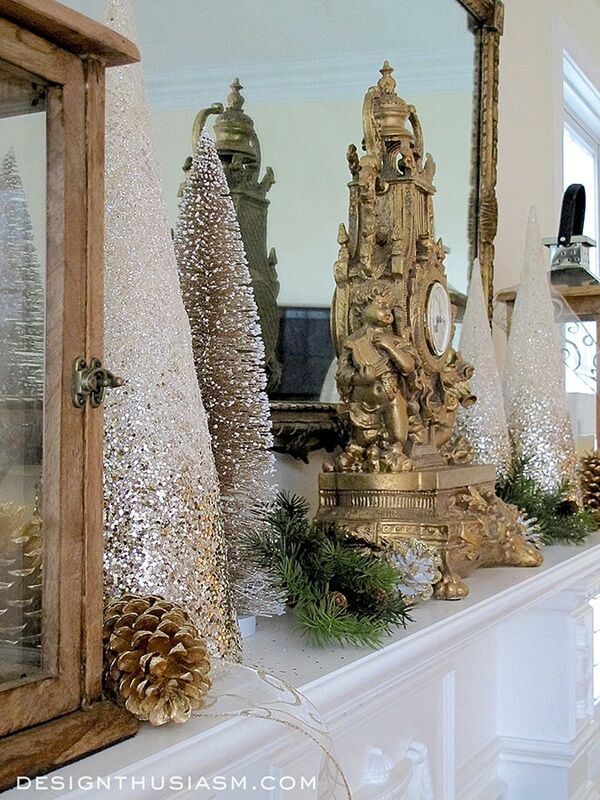 But holiday colors become all the more special when infused with some glimmer, and nothing says glimmer quite like gold. But now, what if you take that gold, and add a touch of holiday red to it? Not next to it, but actually mix it right into the paint (or dye). That’s how you get rose gold! And there’s my justification for using it for the holidays. Well, ok, truth be told, I really like using it because I just think it’s pretty. It fits in with my personal aesthetic and the colors of my home. It plays nicely with my beloved pinks and it’s as festive as anything I can imagine. It combines the pedigree of gold with the warm glow of rosy pinks. 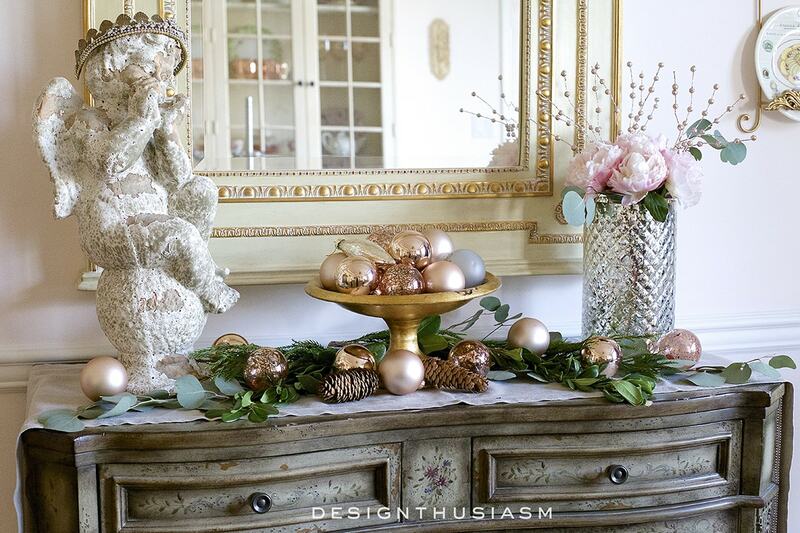 Using rose gold in your holiday decor is as simple as finding some elements in this color feeling and mixing them in with pinks, golds, and holiday greenery. 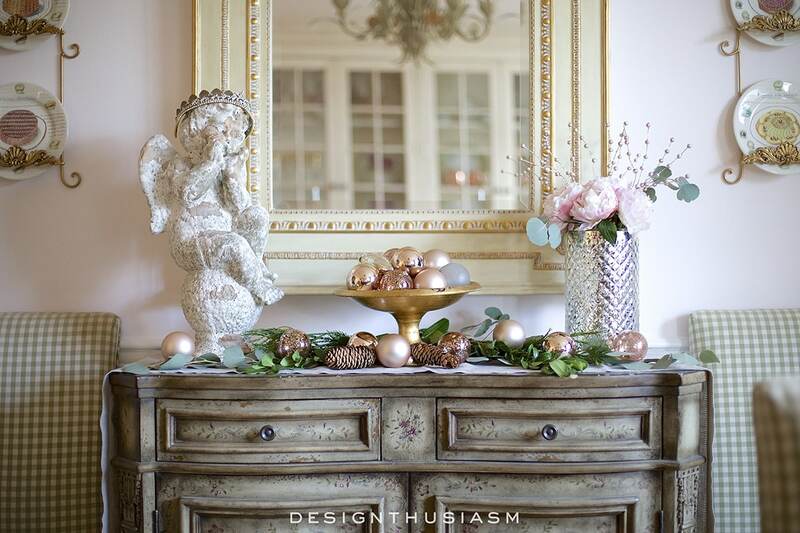 In this case I went with ornaments in 3 different finishes and nestled them in a gilded bowl. Surrounding this grouping are whites and ivories, greens and bits of nature, and silver, as well, provided by a mercury glass vase. I love mixing metals and it works perfectly for this look. The underpinning for this vignette is a natural linen runner, and neutral tones are right at home with rose gold. 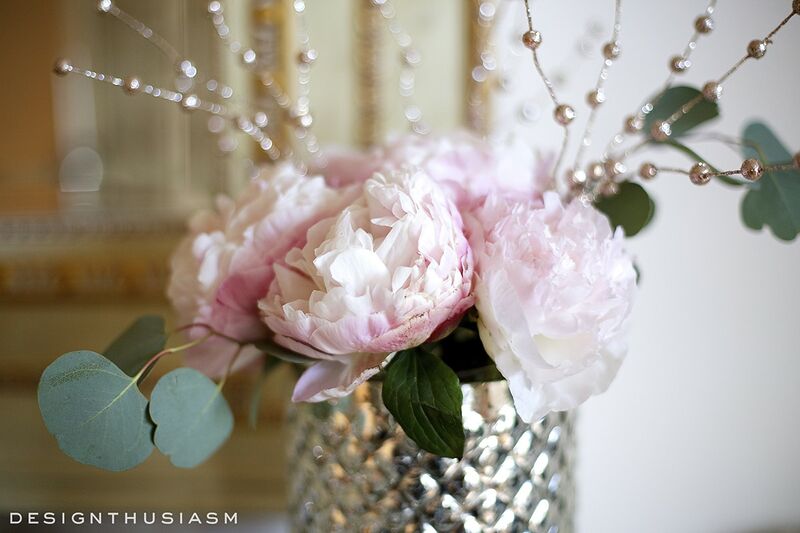 Nothing brings out the rosy pink tones quite like pale pink flowers. I’ve been absolutely charmed to find peonies the last few weeks and I couldn’t be more delighted. 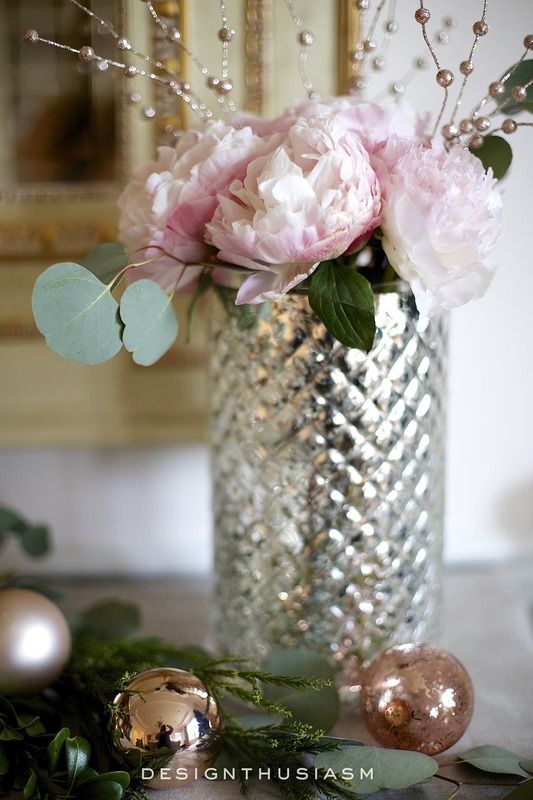 But any blush pink floral will work equally as well. Next week I’ll be playing with a table setting in this color feeling, and then will move on to some other fun color palettes. But I truly love the softened mood of these subtle colors, and the fact that they blend seamlessly with the decor in all of my rooms is testament to the fact that rose gold is my thing! I love these soft colors! 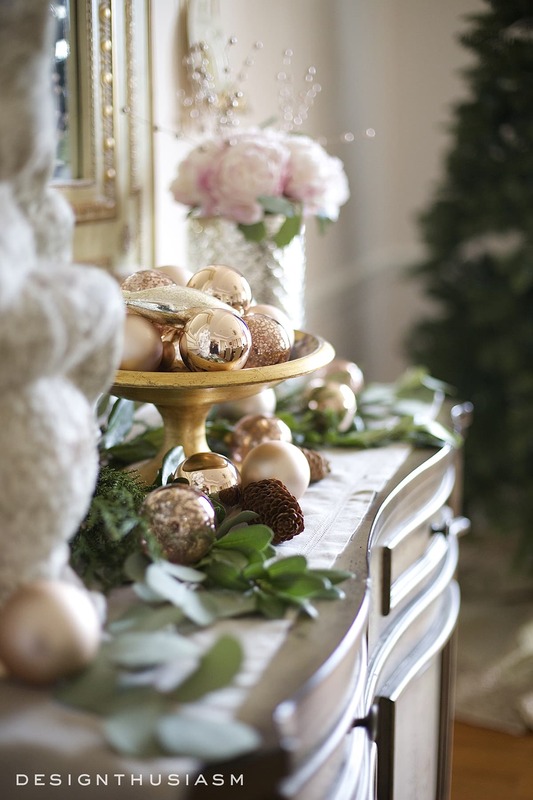 Rose gold is so pretty mixed with your beautiful French decor. Lovely Lory! 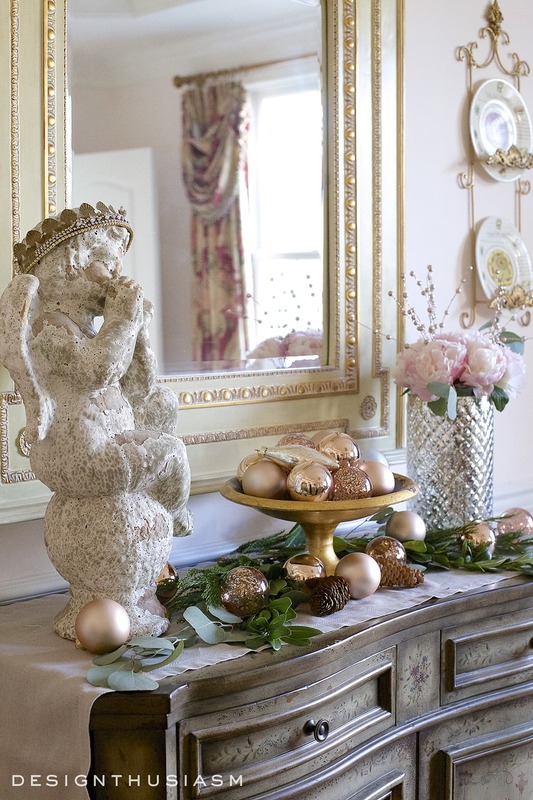 Lory, this is so beautiful….I’m decorating with bright green and red this year, but just did a post on my blog about a shabby pastel holiday too. 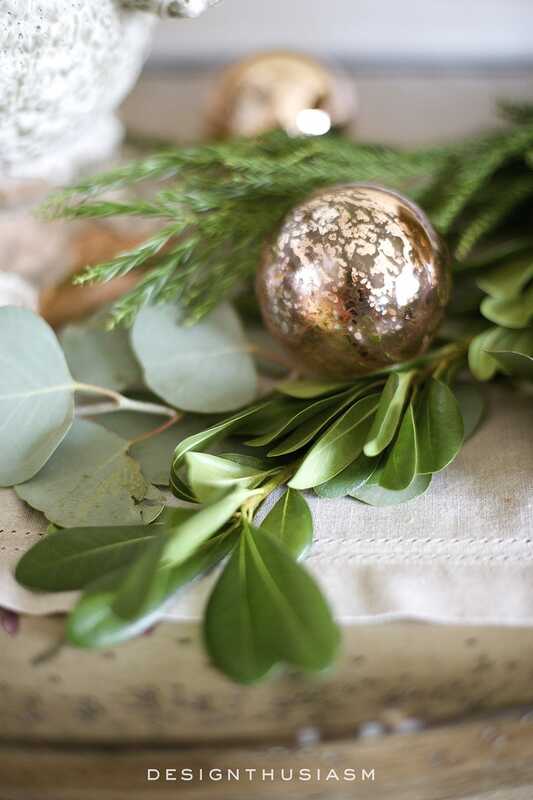 No matter what colors we use, decorating for the holidays is a chance to make our homes look inviting and welcoming for the people we love. Your colors are beautiful, and your style is always inspiring! Thanks so much, Lidy! I’ll have to check out that post of yours… 🙂 I always love your style too!! I do all whites and mixed metals but added blush this year. Loving your rose gold choices! ? I love that color combination and the other coordinating colors that go with it. It is very versatile. I almost did a combination of coppery tones with the blushes and a sprinkle of aqua this year, but I had nothing in that color way and starting from scratch was out of my budget this year. However, I will be hitting those after Christmas decor sales and be ready for next year! Always love the sophistication you bring, and the elegant touches! Love the colors; gorgeous as always! I share your sentiments on the softer color palette. 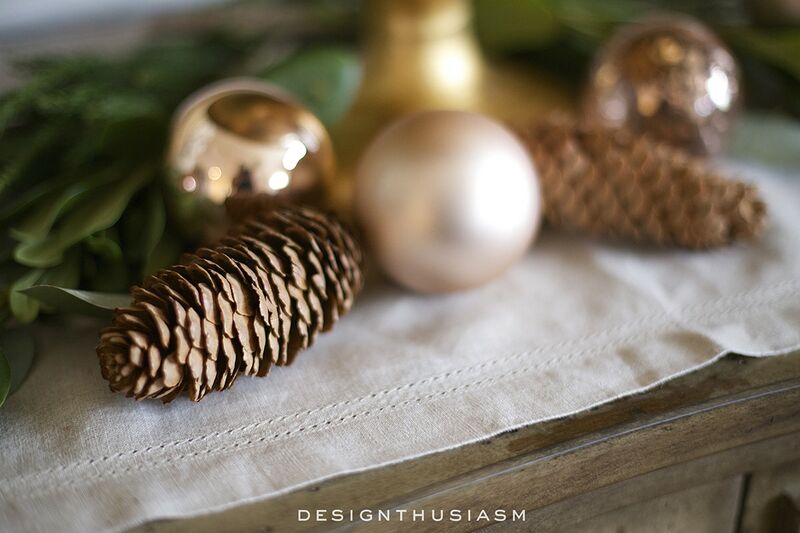 There is something very soothing about gold/rose gold and your vignette feels very sophisticated. My husband loves the traditional colors so I always have one table with his favorites. Thanks so much for the inspiration! Such a lovely color! 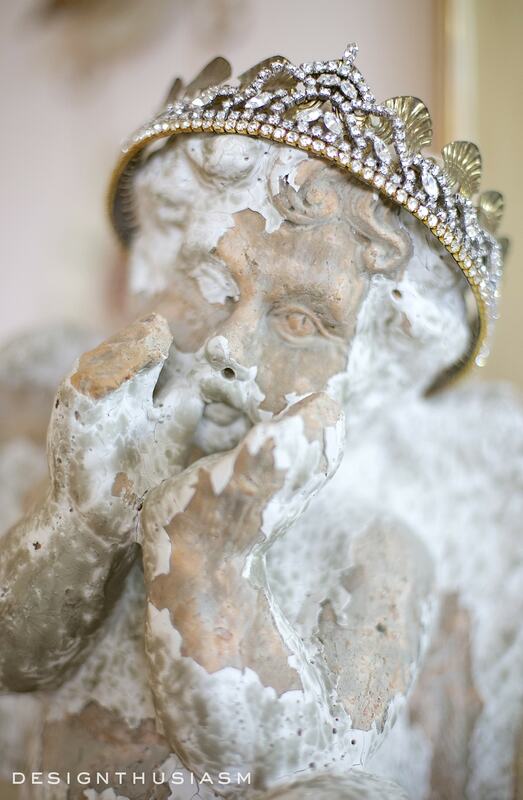 Loving the crowned cherub for a whimsical touch! Oooh, that sounds like something fun to look for!